Though every president seems enveloped in controversy at least once during his term, most of those deemed "scandalous" share the added distinction of serving just after, if not amidst, a military crisis. It is almost as though the patriotism that unites the country also serves as a smokescreen behind which unsavory deeds can be hidden. Warren G. Harding put an engaging and charismatic face on one of the most corrupt presidential administrations in American history. The years immediately following World War I saw a resurgence in political corruption, and one of the most notorious scandals in presidential history. The Teapot Dome Scandal during Warren G. Harding's presidency began in 1921 when Harding, in a move subsequently deemed illegal by the Supreme Court, transferred responsibility for naval oil reserve lands to the Department of the Interior. The Secretary of the Interior, Albert B. Fall, went on to exploit those rights for his own gain, in 1922 secretly granting exclusive rights to the Teapot Dome reserve in Wyoming to the Mammoth Oil Company in exchange for cash and no interest "loans." He granted rights to the Elk Hills and Buena Vista Hills reserves in California to the Pan American Petroleum Company in 1921-22 for similar compensation. No secret is kept for long in Washington, however, and the scandal soon came to light with congressional demands that the leases be abrogated. Subsequent investigations led to the arrest, trial, and conviction of Fall, the first ever for an active cabinet member. Though it was determined that Harding himself had not benefited from the bribery, the spotlight on his administration soon revealed it to be the most corrupt collection of officials since the Grant administration, later dubbed the "Ohio Gang." 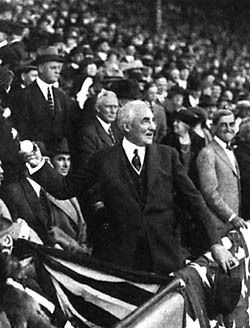 Harding died before the extent of the corruption was known, but congressional investigations into the scandals and corruption that characterized his administration eventually sent two of his cabinet members to jail for bribery, while a third was tried and acquitted of conspiracy charges. Harding's most lasting legacy is the addition of "teapot dome" to the American political vernacular as a synonym for public corruption.